Recent decades have increasingly seen the consumption of livestock products become widely debated in the public domain. The impact its production has on the environment, and the associated animal welfare issues, add fuel to this. It could be expected, then, that people who consume high quantities of animal products will demonstrate a low awareness of the environmental impacts related to the livestock production industry. Research undertaken for my Master’s dissertation investigated this. I conducted a survey with 192 respondents from different dietary groups – meat eaters, vegetarians, and vegans. The purpose was to establish different perceptions of the environmental impacts and moral concerns related to the livestock production industry, and also to establish levels of general environmental concern among the different dietary groups. I also looked at the potential willingness of people to reduce their meat and dairy intake, and the justifications for their choices. My research found that meat-eaters displayed a lower level of both environmental and moral concern related to the consumption of livestock products than vegetarians and vegans. Additionally, vegetarians demonstrated a lower level of concern than vegans. While this could have been expected, an interesting finding is the high level of general environmental concern exhibited across all dietary groups. This was tested using ‘The New Ecological Paradigm’ – a scale devised by Dunlap and Van Liere in 1978 to measure the extent to which one feels interconnected with their surrounding nature. On average, members of all dietary groups displayed a high level of general environmental concern. This suggests, somewhat surprisingly, that the consumption of livestock products is disassociated from its environmental and moral implications. This can be seen in the bubble graph below – produced from the results of the dissertation – particularly among meat-eaters (red bubbles). Scoring high values for the ‘New Ecological Paradigm’ (x-axis) did not automatically indicate a high awareness of the environmental impacts related specifically to livestock production (y-axis), and only 7% of meat-eaters scored low values for both. An increasing body of research points towards the necessity of reducing our animal product intake. A recent report from the World Wildlife Fund and the Zoological Society of London indicates that human activity has caused the population of marine mammals, birds, fish and reptiles to reduce by 49% since 1970. Alongside other environmental problems, such as high land and water use, reducing the consumption of animal products is therefore essential for sustainability. Establishing plant-based alternatives that can replace meat in a meal may be one of the most effective ways to do this. Findings from my dissertation project suggest, though, that the alternatives currently available on the market are not targeting the right groups in order to maximise this potential – specifically, they are not targeting meat-eaters. The dissimilar sensory characteristics of plant-based alternatives to meat were indicated as the primary reason for this, and it seems necessary to refine the look, taste, and feel of these alternatives to make them more appealing to a wider demographic. Previous research has investigated the main justifications that people employ for eating meat, with the main reason predominantly being taste. This contradicts the fond regard of animals that a large majority of people have, and suggests that the animal is mentally separated from the meat it produces. Findings from my project further identifies irregularities in the consumption of dairy products, particularly among vegetarians, and proposes the possibility of a ‘dairy paradox’. 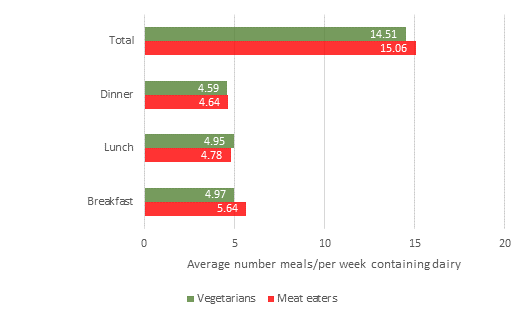 Both meat-eaters and vegetarians displayed an awareness of the environmental impacts of consuming dairy products, yet despite over half of dairy-eating respondents indicating that they had considered reducing their intake, it was still consumed at a high level (see image below – produced as part of the dissertation), levels higher than the intake of meat displayed by meat-eaters (12.44 meals per/week contained meat on average). 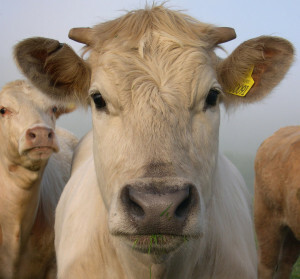 To summarise, it is important that any efforts to mitigate the environmental impacts of the livestock production industry should not solely address meat consumption, and I would suggest that a tantamount focus is placed on reducing the intake of dairy products, in order to lessen the effect of the observed ‘dairy paradox’, and the impacts of livestock production as a whole. The Centre for Environmental Strategy runs masters degree courses on many different aspects sustainability. If you are interested in finding out more information, please visit the website.